Power your Olympus E-10 or E-20 with alkaline D cells! Hundreds of exposures are now possible from a single D alkaline battery (8 cells) carried in a "fanny-pack" and an AA alkaline battery (4 cells) installed in the camera. This is made possible by utilizing exclusive integrated circuitry to "flatten" the sloping characteristic discharge curve, which until now has made alkaline battery technology totally unsuitable for the power-hungry demands of these high-end cameras. Additional circuits perform a highly reliable battery load test on turn-on as well as real-time monitoring of power delivery to the camera. Power regulation is precise, assuring safe operating parameters. Designed and tested extensively by Allan I. Presser, B.A., M.A., Industrial Arts. Keep in mind that alkaline D cells pack a lot of energy: The sixbullets.com battery extracts approximately the same amount of energy from each D cell as that carried by a .30-06 rifle bullet at the muzzle! This is made possible only by electronic conditioning; without the active electronics, not more than 10% of the battery's chemical energy would be usable to power the camera. Other popular types have their advantages too, but keep in mind all rechargeable batteries lose some capacity to recharge with each and every charge-discharge cycle. If you have had unsatisfactory results with rechargeable Ni-MH, Ni-Cd, or Lithium polymer types, then by all means consider this new alternative. Max. Output Current (short circuit): 2.5a, 30 sec. max. Battery weight (empty/gross): 9.5 oz./50 oz. Can pictures be taken using only the sixbullets.com battery without AA cells loaded in the camera? No. The E-10 AA camera battery acts as buffer, conducting in parallel on transient current demands (as during focusing and file storage) which exceed the peak current available from the sixbullets.com battery. During the rated life of the sixbullets.com battery, the power supplied by the E-10 is nominal up to 500 exposures, but essential to prevent the camera from self-powering down. Why is the sixbullets.com battery rated 50% higher when Ni-MH cells are installed in the E-10? Ni-MH cells operate at lower voltage than alkalines. At the 500 exposure point, the output voltage of the sixbullets.com battery has dropped to a point where the E-10 would rapidly drain alkalines. However, in the case of Ni-MH cells, picture taking can continue until the camera low-battery icon starts to flash in the control panel or monitor. How do I know when to stop shooting before I run the risk of discharging the E-10 alkaline battery pack? The estimated life of the sixbullets.com battery is 500 shots when using alkalines in the E-10. A very good indicator of is the real-time power monitor LED lamp. Take a test exposure while observing the LED. When it begins blinking out, even momentarily, when the camera focusing motor actuates or the image is being stored, it is a sure indication that the 8 D cells need to be replaced. Will it do any harm to continue shooting until the E-10 alkaline battery pack is totally exhausted? Not at all. The camera will continue to function for at least 100 shots and possibly more, once the point is reached where the LED starts to momentarily blink out during picture-taking. Eventually the camera low-battery icon begins to blink, signaling the AA alkalines have reached the end of their useful life. It is actually possible to continue shooting until the camera turns itself off. The total number of shots in bench testing exceeded 800 exposures before automatic power down! After taking 500 shots with an alkaline E-10 battery pack, can I then substitute Ni-MH cells in the E-10 and continue shooting? Indeed it is feasible to do so. Hundreds of additional shots can be taken, further drawing down the sixbullets.com battery. Ni-MH cells allow the sixbullets.com battery to be discharged down to the level where its LED warns of low battery when switched on. See the instructions for use section below. Why not just use NiMH AA cells exclusively in the E-10 to take advantage of the excellent service life profile of the sixbullets.com battery and forgo altogether AA alkalines? Its a trade-off. Fewer pictures with the E-10 alkaline pack in exchange for the freedom from the hassles associated with recharging, self-discharge phenomenon, "memory", and reduced capacity throughout the charge-discharge cycle of Ni-MH cells. One never knows for sure just how much energy is in a recharged Ni-MH cell until it is placed into service. This is especially important when traveling, where the matchless reliability of alkalines is a necessity. For around the house use, Ni-MH cells are very convenient; in fact, if only a couple of frames are expected to be taken, they can simply be used by themselves. May I install high technology substitutes (NiCd, Ni-MH, Lithium, etc.) for the 8 D cells in the sixbullets.com electronic-controlled camera battery to improve its performance or lower operating costs? How about low tech carbon-zinc cells? No. 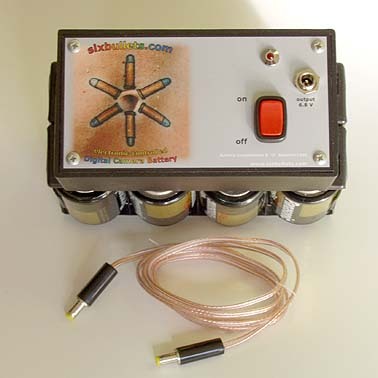 For reliability and safety, only alkaline technology cells must be used as replacements. The sixbullets.com power supply has not been tested or approved for use with any rechargeable or high density battery. I do not seem able to achieve the battery service life specifications from my usage of the sixbullets.com (and/or E-10 battery pack). What's wrong? You pattern of usage likely differs significantly from the test protocol which was designed to mimic real-world conditions. Excessive use of the sixbullets.com battery to power camera for slide shows, monitor view finding or playback, file downloading, etc. may adversely affect the number of exposures obtained. Review the test protocol, instructions for use, and troubleshooting. Because there are two batteries to deal with, sixbullets.com and the E-10 pack, is there difficulty in managing them differentially in terms of usage and condition? After reading the instructions for use and the troubleshooting guide, one should have no trouble. Each battery has its own diagnostic capability. Both the sixbullets.com battery and the E-10 perform a state-of-charge test upon switch-on as well as real-time monitoring during operation. What functions are provided by the LED indicator lamp on the sixbullets.com battery? There are three functions. First, it serves as a pilot light. When the battery on-off switch is off, the LED is off. When the on-off switch is on, the LED is on, unless the D cells are dead or incorrectly installed. Second, on battery turn-on, the D cells undergo an automatic load test for two seconds. If the cells are good, the LED lights up instantly on battery turn-on; if the cells are bad, the LED remains extinguished for two seconds, then lights (unless the cells are dead). Third, when the battery is switched on and in use, it monitors the output voltage continuously and in real-time. Whenever the sixbullets.com battery is supplying 100% of the power needs of the camera, the LED stays illuminated; whenever the internal AA E-10 battery pack is providing an assist, the LED blinks out during the assist interval. Will a single E-10 battery pack last for the life of a set of 8 alkaline D cells in the sixbullets.com camera battery? In the case of all alkalines, the rule of thumb answer is yes. When a Ni-MH battery is used in the E-10, there are many variables as a result, there may be a mismatch and the E-10 pack may have to be replaced with a back-up to continue drawing down the sixbullets.com battery. Rest assured that the sixbullets.com battery, during its rated service life, will extend substantially any E-10 battery pack because it supplies 100% of the power demands of the camera during standby and monitor operation. May I substitute a coiled power cord as a replacement for the twin conductor cable provided? This is not recommended and will likely cause trouble. In testing, a commercially available cord was found to have too much "pull", to produce too high a voltage drop, and its plug to make an intermittent connection at the power input jack of the E-10. Do not substitute the sixbullets.com supplied cable or make any other modifications or perform any internal adjustments as doing so may impair performance or damage your equipment. Can the sixbullets.com battery be used as a power source for other than the E-10 or E-20 digital cameras? It is compatible with any Olympus camera for which the a.c. adapter Model C-7AU is specified. No claim is made for other applications. Terms of Sale: Method of shipping USPS, UPS, or FedEx at seller’s option. Signature of purchaser required at time of delivery. No credit cards accepted at this time. Purchaser will be notified and given option to cancel order if order cannot be shipped within 14 days upon receipt of order form. Please allow sufficient time for personal checks to clear bank. 30 days full refund with return of product if purchaser dissatisfied. 90 day free replacement of defective power cord. 1 year free service on parts and labor, D cells excluded. All times based upon date of receipt of product. Purchaser bears cost of shipping returned or defective goods and assumes responsibility for safe return of same to sixbullets.com. sixbullets.com not liable for product failure due to gross negligence or tampering with internal adjustments. City of Las Animas business license number: 400. Install four fresh AA alkaline cells in camera. Install eight fresh D alkaline cells in sixbullets.com battery. Place the battery in the waist pack and buckle it to the waist. Turn on camera and observe control panel. Battery check symbol will appear for a few seconds and extinguish to confirm correct operation. Turn on sixbullets.com battery. LED lamp will light instantaneously to confirm correct operation. Plug either end of power cord into the sixbullets.com battery and the other end into the DC input jack of the camera. Commence picture taking. The sixbullets.com battery can be left turned on and connected to the camera during the photo session; switch the camera off if more than a few minutes idle time is expected. For more picture taking, just switch the camera back on. If during the picture taking session, the LED lamp of the sixbullets.com momentarily blinks out during camera functioning, the D cells are weak and need to be replaced. If the camera battery symbol flashes on the control panel, stop picture taking and begin at step 3 to isolate the problem. When the session is finished, switch the camera off, switch the sixbullets.com battery off and disconnect the power cord from the camera. To start a new session, repeat steps 3 and 4. If the camera fails step 3, replace the AA alkaline battery pack. If the sixbullets.com battery LED lamp fails to light or remains dark for two seconds following battery switch turn-on, the D cells are weak and need to be replaced. If both camera and sixbullets.com batteries check OK in steps 3 and 4, then, take a test picture while observing the LED lamp of the sixbullets.com battery. If the LED lamp remains continuously illuminated during camera functioning, then proceed to step 5 to commence picture taking. If the LED momentarily blinks out during camera focusing or image storage, the D cells are too weak for use with a AA camera battery pack and the D cells need to be replaced; in that case, return to step 2. Install four freshly charged AA Ni-MH cells in camera. Commence picture taking. The sixbullets.com battery can be left turned on and connected to the camera during the photo session; switch the camera off if more than a few minutes idle time is expected. For more picture taking, just switch the camera back on. After a period of usage, the LED lamp of the sixbullets.com battery may momentarily blink out during camera functioning, particularly during focusing and image storage; this is normal. If the camera battery symbol flashes on the control panel, stop picture taking and begin at step 3 to isolate the problem. To start a new session, repeat steps 3 and 4. If OK, then, proceed to step 5 to commence picture taking. If the camera fails step 3, replace the Ni-MH pack. If the sixbullets.com battery LED lamp fails to light or remains dark for two seconds following battery switch turn-on, the D cells are weak and need to be replaced. In that case, return to step 2. D cell(s) not seated in contact with terminal(s). Push each cell firmly towards its positive terminal. D cell(s) installed with wrong polarity. Reinstall correctly. Power cord is shorted. Do not attempt to use cord. Contact sixbullets.com for replacement. Camera operation continued with depleted D cells. See instructions for use. sixbullets.com battery pack switched off. Remember to switch it on before photo session; keep waist pack directly in front of body to avoid accidentally pressing on-off switch. Bad or poorly charged Ni-MH cells. Perform a trial using new AA alkalines. Power switch left on for extended time. Turn off after photo session and if extended transport or storage is anticipated, remove at least one of the D cells to prevent accidental turn-on. Pattern of usage differs markedly from test protocol. Review test protocol; severe use affects service life. Cold ambient temperature. If possible warm battery before shooting in extreme cold. It is normal to experience shortened battery life in cold climates. From sixbullets.com battery, route cord under clothing, pass through neck opening, and then plug into camera input jack. Power cord is shorted or unit is defective. Turn off the battery, disconnect it from the camera, unbuckle it from the waist and remove the D cells from the battery holder. Contact sixbullets.com for service. It is normal however, for the D cells and the electronic enclosure to get slightly warm when powering the E-10. sixbullets.com disclaims any and all liability for consequential damages of any kind whatsoever. The liability of sixbullets.com is limited to the terms of sale as stated in the above section, How to Order. sixbullets.com is a third-party supplier and not connected to Olympus America Inc., Olympus Optical Co., Ltd., or Olympus Optical Co. (Europa) Gmbh.